In 1714 John Aubrey wrote "Anciently the leghs (now corruptly called sleights), that is pastures, were noble large grounds." The word sleight, also spelt slaight or slite, derives from the Old English slœget meaning a sheep pasture. Shown as the Sheepslite on Philip Byles' map of 1653, it covered a total of 95a 0r 35p reaching from Mudford Road in the west to halfway to the River Yeo in the east and accounted for just under half of the total area of Great Lyde Farm or, as it was called in 1653 - Lyde farm. By the time of the 1846 Tithe Award this great field had been spilt into two; Higher Sleight (898) in the west and Lyde Sleight (897) in the east. By minor boundary changes or (most likely) more accurate surveying techniques, the areas involved reduced significantly with Higher Sleight recorded as 20a 2r 0p and Lyde Sleight recorded as 44a 0r 30p in the 1846 Tithe Award. The 1846 combined area of both fields was 64a 2r 30p, being 30a 2r 5p smaller in area than the 1653 surveyed area!!! Higher Sleight was bounded on the north by the Yeovil Borough boundary, to the east by Lyde Sleight, to the south by Long Orchard (899) and to the west by Lyde Brook. 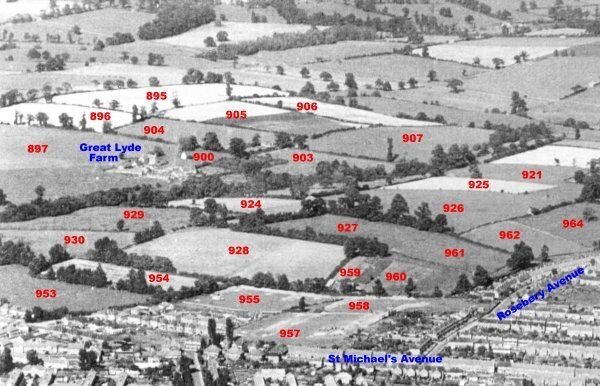 Lyde Sleight was bounded on the north by the Yeovil Borough boundary, to the west by Higher Sleight, to the south by Long Orchard (899) and Great Lyde farm and to the east by Higher Eight Acres (896) and Lower Eight Acres (904). Today Higher Sleight is occupied by the housing of Lower Fairmead Road, Runnymede Road and Magna Close while Lyde Sleight is occupied by Cavalier Way, Constable Close, Gainsborough Way, Bedford Road and Hertford Road. Philip Byles' map of Lyde Farm dated 31 January 1653. 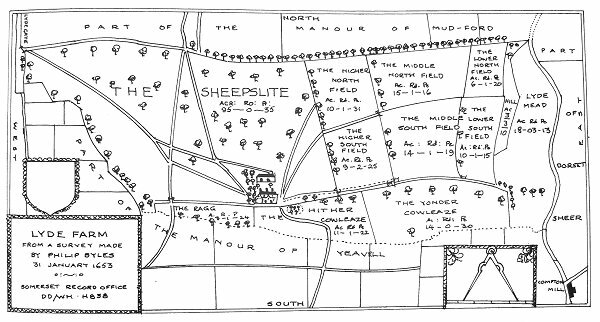 The Sheepslite is the huge field occupying most of the western half of Lyde Farm.